Is becoming a parent one of your proudest achievements? Have you noticed how quickly those little hands and feet are growing? Do you want to capture every crease & wrinkle of your child before it’s too late and these moments fade to memories? 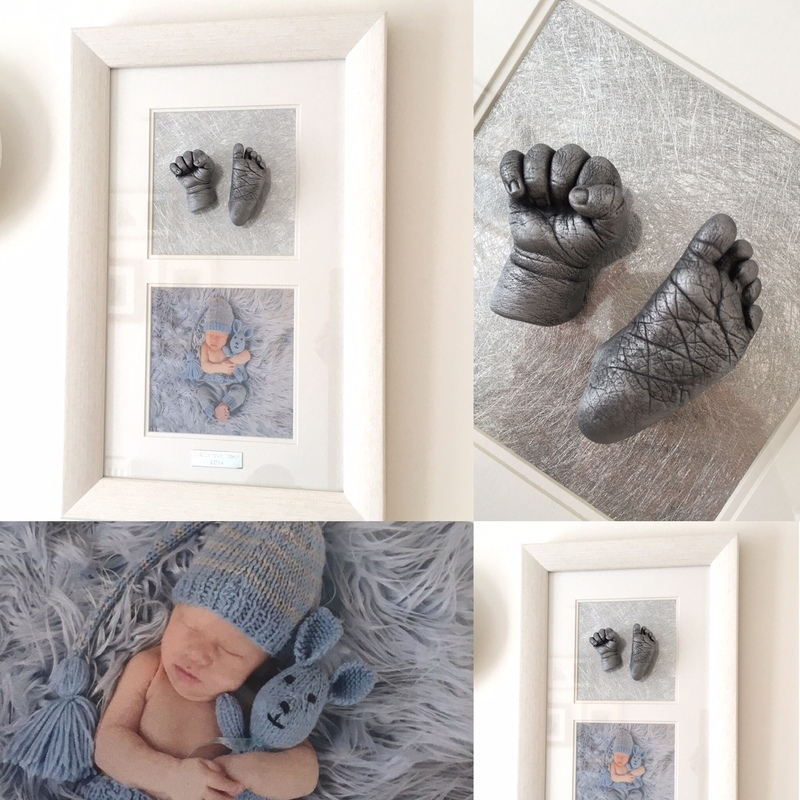 Your baby casts will be as unique as your child…and just as impressive. 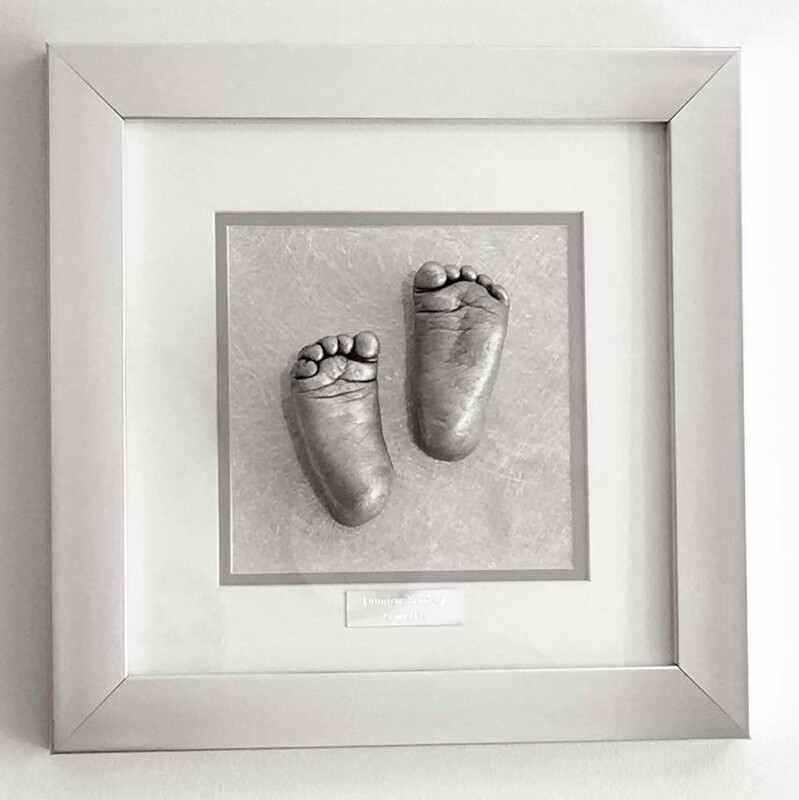 A standard single aperture frame can have two casts – both feet or hand & foot of baby under 12 months old. 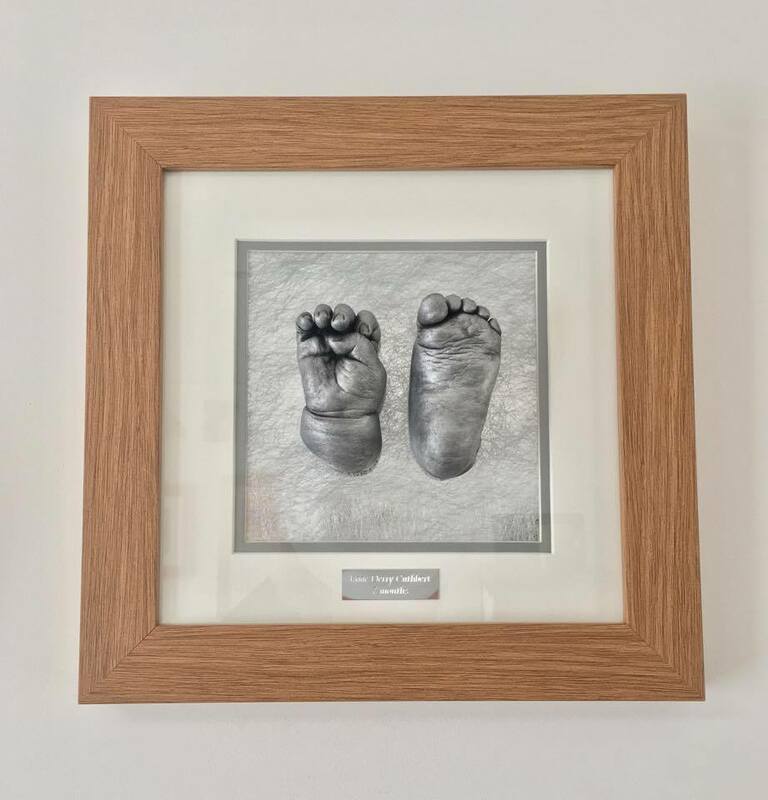 Choose from Black, White or Wood effect frame with an engraved name plaque and baby casts finished in antique silver or bronze effect. 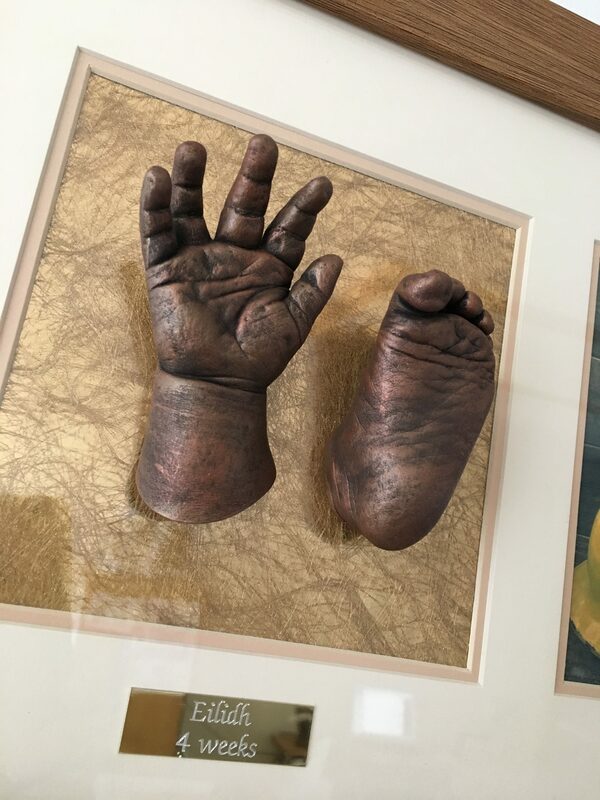 Where will you display your unique babies casts? 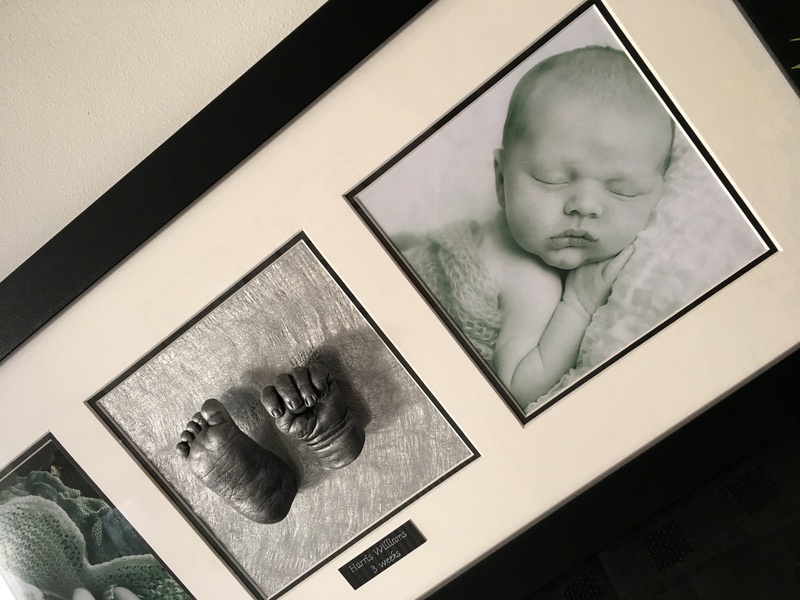 Your 3D life casts will be of the very highest standard & quality and they deserve a touch of luxury in their frame too. By opting for my superior frame range you are getting a beautifully handmade, made to order frame created by a local, top class framer. Your casts are as unique as your child and your frame can be too. 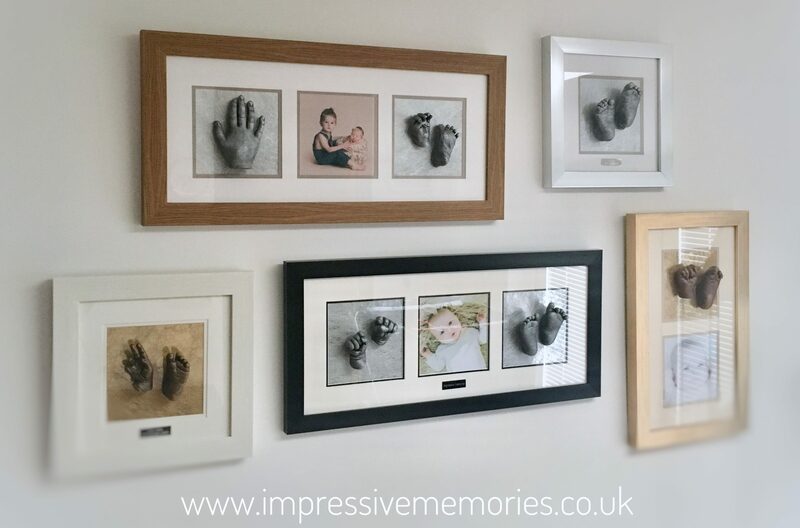 If you would like a specific finish, style, layout of a frame or varied mount options…you can have them! 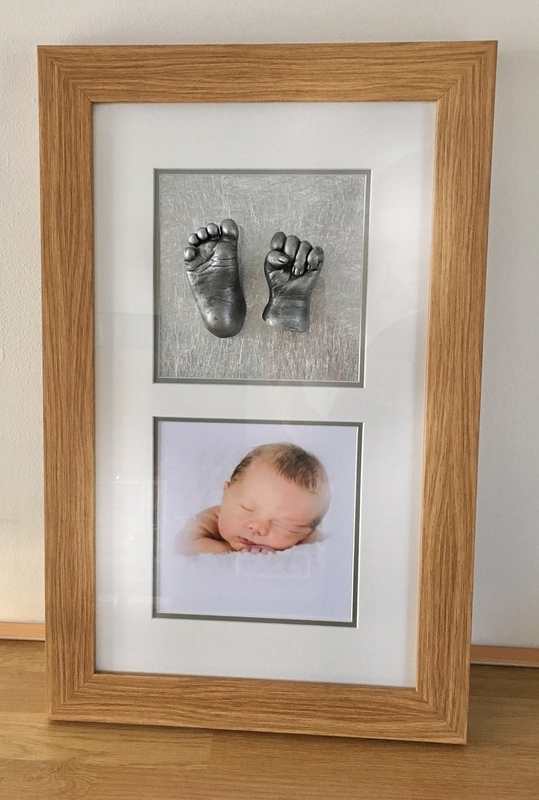 Luxury Single Aperture Frame with 2 casts (2 feet or hand & foot) £120. 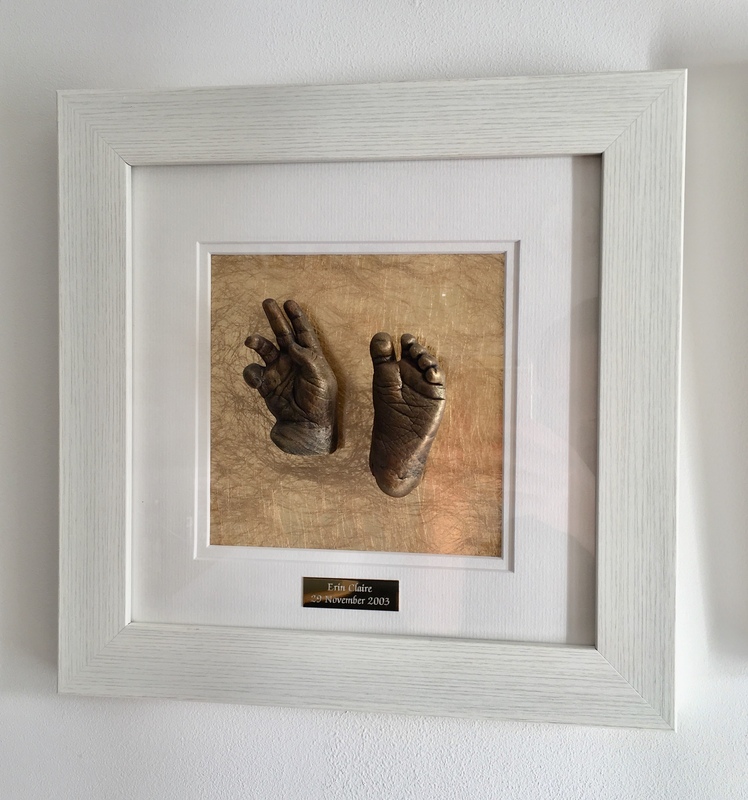 This Silver frame is simply stunning and accompanied with your antique silver casts it will be a talking point for years to come. Also available in an Oak style frame, Black, White & Distressed Gold. 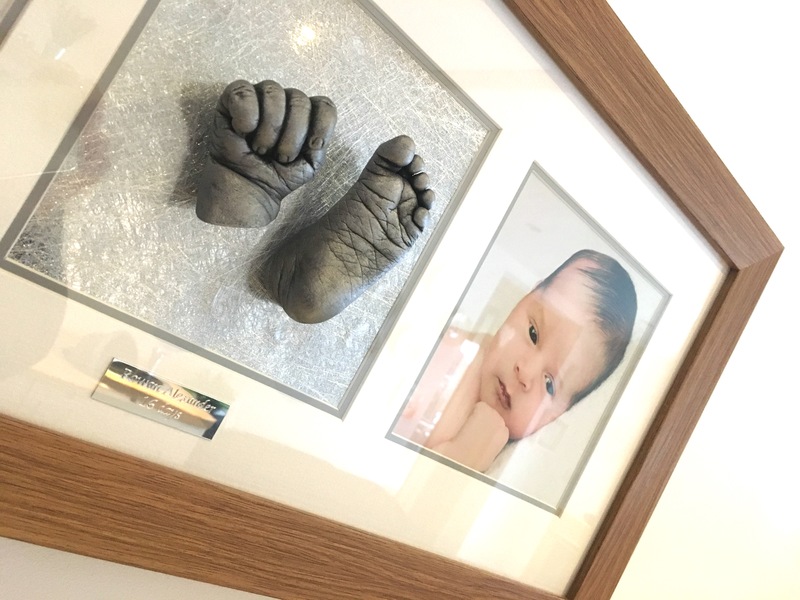 You can choose from a variety of double mounts to coordinate with your decor and create a bespoke finish to compliment your unique baby casts. The time to take each cast is just a couple of minutes. Baby can be asleep or awake – often feeding them, while I cast, will help to relax and settle them. What if my Baby Wriggles? Not a problem! 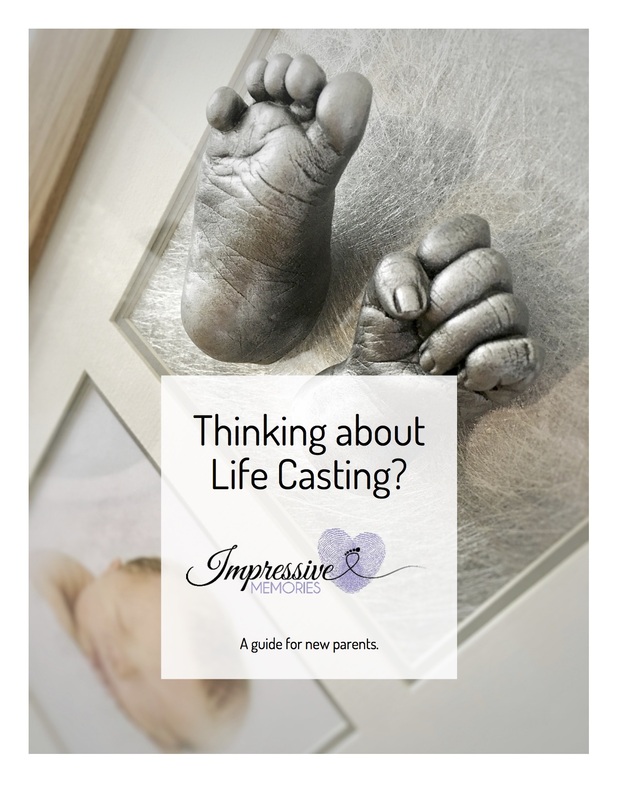 All babies wriggle…this will not prevent your casts from being impressive. 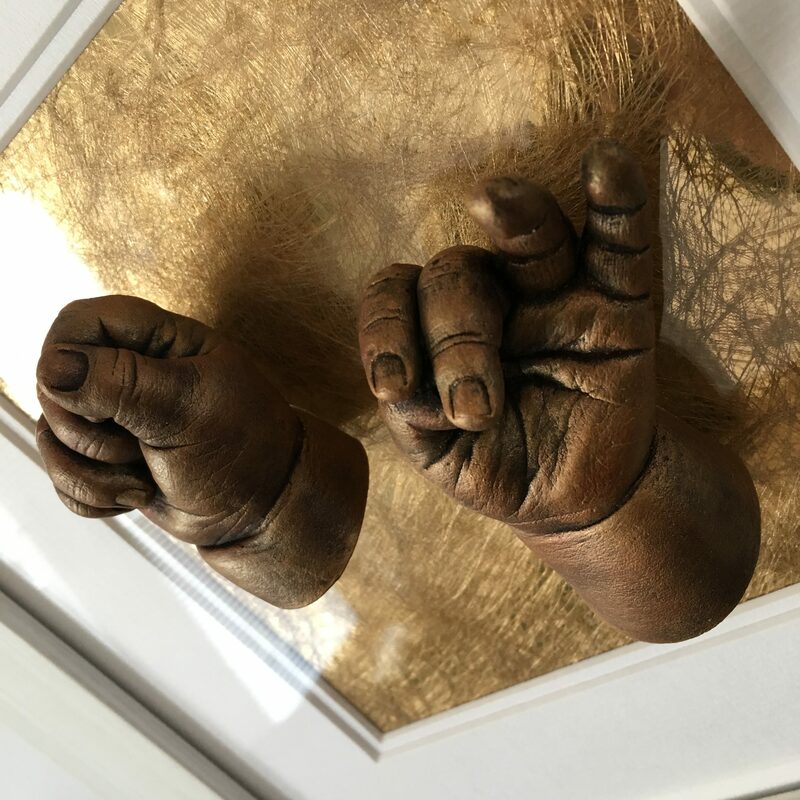 Do all casts have to be framed? No – I also offer hand clasps, family castings & stand-alone sculptures I am happy to advise & quote for bespoke orders. Is there an age limit to casting? No – I have cast babies just hours old, some who arrived in the world far sooner than they were expected to. Also I have cast a Grandad’s hand who was in his 90’s. Age is never an issue but it might alter the style & displaying options of your casting. I am happy to advise & quote for bespoke orders. Yes. It is a gentle and safe process, using natural products. You are also fully protected and insured whilst visiting Impressive Memories. 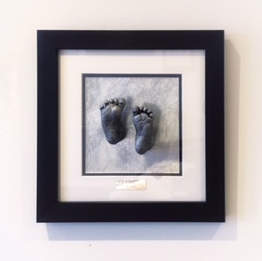 This Luxury Black Frame is simple & elegant and accompanied with your antique silver or bronze casts it will be a memorable talking point for years to come. 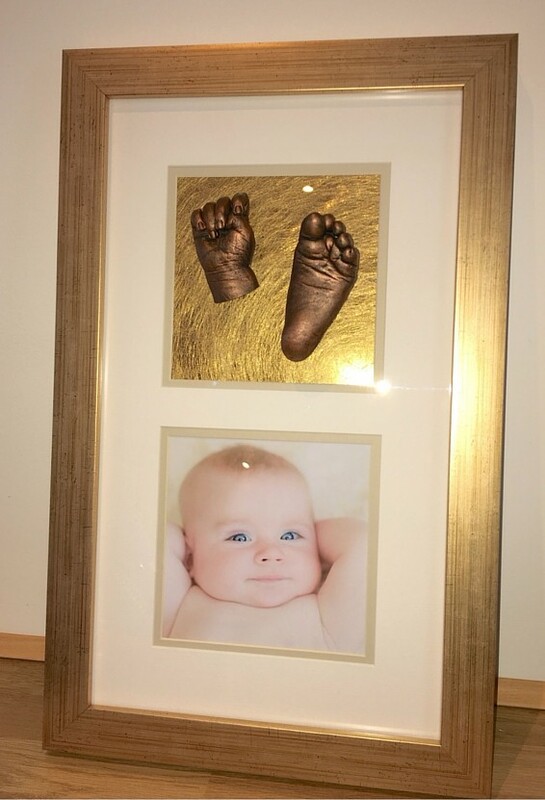 Also available in an Oak style frame, Silver, White & Distressed Gold. 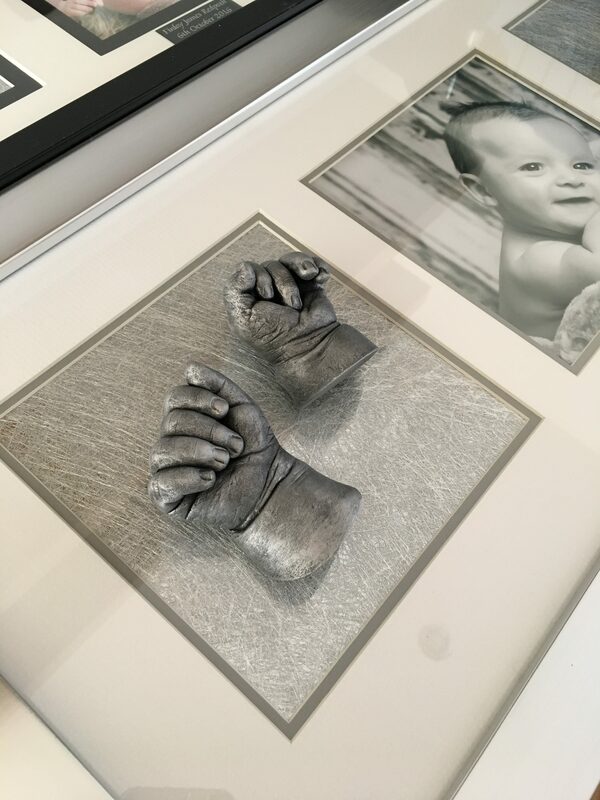 You can choose from a variety of double mounts to coordinate with your decor and create a bespoke finish to compliment your unique baby casts. What are the casts made of? I use a high-quality stone to give excellent strength, definition, longevity & finish. I do NOT use plaster of Paris!! I can also work in resin, cold casting & lead crystal. I need duplicates - can this be done? I can duplicate your casts BUT I prefer not to. 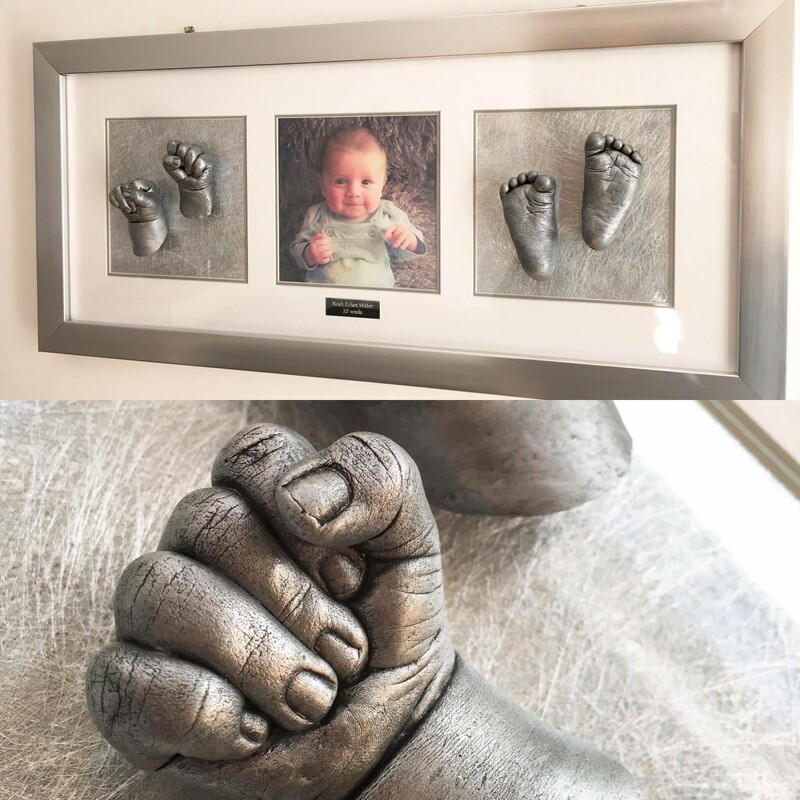 The beauty of baby casting is that each cast is bespoke and is unique your baby. If you need duplicates we can discuss this and I can advise you of the best process. This luxury double frame in Distressed Gold is beautiful. 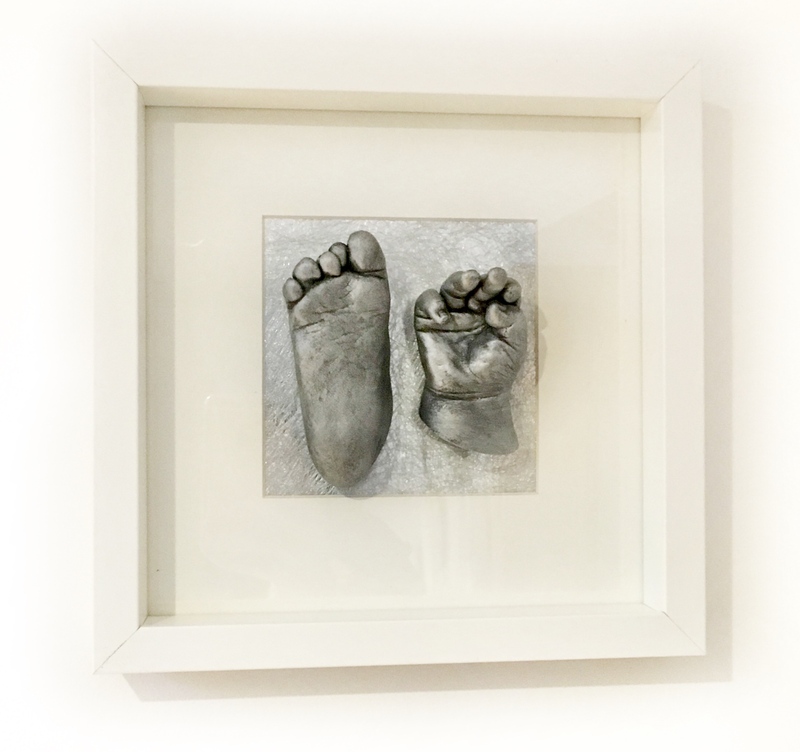 You can choose whether to cast a pair of feet or a hand and foot to display proudly on your wall for years to come. Imagine letting your child see themselves, and see how impressed you are with them? Choose from Gold, Silver, Oak-effect, Black or White – whatever your decor prefers. When you opt for the triple aperture frame you can create all sorts of combinations of casts & photos. 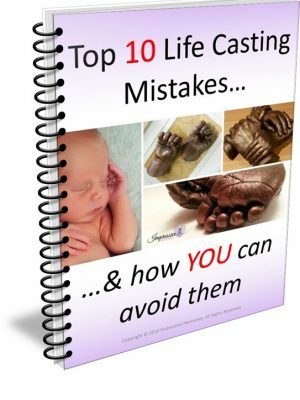 In this blog, I am giving you all the information you need to know, about life casting. My aim is to help you avoid making financial mistakes that could lead to heartbreaking consequences.